Berlin, 2 September 2009. Investing in restoration and maintenance of the Earth’s multi-trillion dollar ecosystems - from forests and mangroves to wetlands and river basins - can have a key role in countering climate change and climate-proofing vulnerable economies. 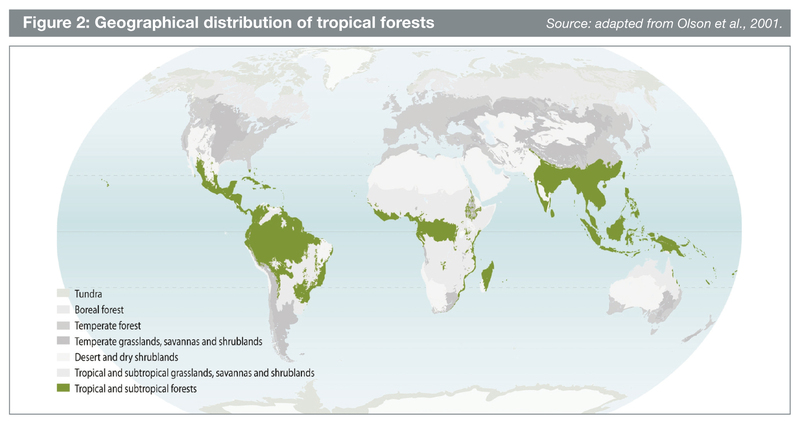 Geographical distribution of tropical forests. This is among the central findings of a new climate issues update by The Economics of Ecosystems and Biodiversity (TEEB), a project launched by Germany and the European Commission in response to a proposal by the G8+5 Environment Ministers (Potsdam, Germany 2007) to develop a global study on the economics of biodiversity loss. The study is hosted by the United Nations Environment Programme. The issues update was launched today by TEEB study leader Pavan Sukhdev, with German Federal Environment Minister Sigmar Gabriel; Director-General for Environment, European Commission, Karl Falkenberg; and UN Under-Secretary General and Executive Director of UNEP, Achim Steiner. It says the planet’s biological diversity and ‘ecological infrastructure’ are increasingly being put at risk from the impact of climbing greenhouse gases. Yet natural systems represent one of the biggest untapped allies against the greatest challenge of this generation, says the paper, part of a stream of work towards a final study in 2010. The update underlines that an agreement on funding for forests is a key priority for governments attending the crucial United Nations climate convention meeting in Copenhagen in December. An estimated 5 gigatonnes or 15 per cent of worldwide carbon dioxide emissions - the principal greenhouse gas - are being absorbed or ‘sequestrated’ by forests every year, making them the "mitigation engine" of the natural world. This could also be described as ‘green carbon’. Investing in ecosystem-based measures such as financing Reduced Emissions from Deforestation and forest Degradation (REDD) could thus not only assist in combating climate change but could also be a key anti-poverty and adaptation measure. Forests also provide services such as freshwaters, soil stabilization, nutrients for agriculture, eco-tourism opportunities and food, fuel and fibre - all of which will be key to buffering vulnerable communities against the climate change already underway. TEEB is urging governments to factor these wider benefits into a forest carbon finance package in order to maximize the return of an agreement in Copenhagen into the future. This might pave the way for a new, Green Economy in the 21st century where natural or nature-based assets become part of mainstream economic and policy planning. The TEEB climate issues update says that governments can already take steps to include ecosystem services in their national accounts in order to "measure what they manage". In support of this, it suggests that an upgrading of the United Nations’ 2003 handbook on Integrated Environmental and Economic Accounting be carried out to include forest carbon. While the precise level of investment needed to maintain and enhance carbon storage and adaptation services of ecosystems in a climate-challenged world is unknown, TEEB findings indicate that investing in the Earth’s ecological infrastructure has the potential to offer an excellent rate of return. For example an investment of $45 billion in protected areas alone could secure nature-based services worth some $5 trillion a year. Meanwhile the update highlights some of the consequences if governments fail to rise to the climate change challenge and seal an ambitious deal in Copenhagen. It underlines a ‘Coral Reef Emergency’ that is already here as a result of the current build-up of greenhouse gases. Scientists contributing to the TEEB process indicate that irreversible damage to coral reefs can occur at atmospheric CO2 concentrations of over 350 parts per million (ppm). This is linked with rising temperatures but also ocean acidification. Concentrations are already above this threshold and rising. It raises concerns that stabilizing CO2 levels at 450 ppm, or some 16 per cent above the current levels, may condemn this critical, multi-billion dollar ecosystem to extinction and take with it the livelihoods of 500 million people within a matter of decades. Pavan Sukhdev, TEEB’s study leader who is on secondment from Deutsche Bank, said the loss of the world’s coral reefs would undermine one of nature’s most productive assets and one that has a key role to play in coastal defense against a predicted rise in storm surges and other extreme weather events due to global warming. "The ecosystem services from coral reefs - ranging from coastal defense to fish nurseries - are worth up to USD$170 billion annually; an estimated half a billion people depend on them for livelihoods and more than a quarter of all marine fish species are dependent on coral reefs". 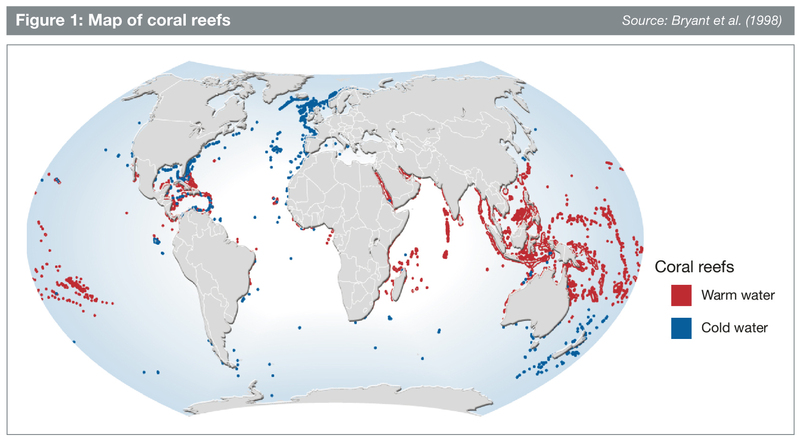 "The climate stabilization goals of many governments may prove sufficient for some ecosystems and some biodiversity but there is now a real question mark against the survival of coral reefs world-wide and their natural treasure troves," he added. "The economic consequences are significant, but so are the social and humanitarian ones. It underlines that a simple cost-benefit analysis alone will fail to capture the ethical dimensions of international climate policy decisions now and in the coming years and decades - especially in respect to an ecosystem at a climatic tipping point," said Mr Sukhdev, who also heads up the Green Economy initiative of the UN Environment Programme. Mr Gabriel said: "Human vulnerability to the harmful impacts of global climate change is significantly increased by the loss of biodiversity. TEEB proves that the protection and restoration of ecological infrastructure is a cost effective means to mitigate global climate change and its effects. To me, ecological restoration is a critical tool in addressing global climate change, enhancing the extent and functioning of carbon sinks as well as reducing greenhouse gas emissions. What we now need is a breakthrough in Copenhagen. We have to recognize that enhancing the resilience of ecosystems and maintaining the planet’s biodiversity are key parts of the mitigation and the adaptation agendas." Mr Falkenberg said: "These TEEB findings demonstrate that climate change and biodiversity loss must be tackled together. They lend further support to the EU's goal of achieving a concrete and ambitious agreement in Copenhagen that comprises both reductions in the world's greenhouse gas emissions and the creation of global mechanisms to stop tropical deforestation. Quite simply, we will not manage to halt biodiversity loss if we do not mitigate climate change. And we will not be able to mitigate and adapt to climate change if we do not protect our valuable ecosystems and biodiversity." Achim Steiner, UN Under-Secretary General and Executive Director of UNEP, said: "It is clearly emerging that investments in the planet’s ecosystem infrastructure can deliver the twin, Green Economy gains of curbing and cutting emissions while assisting vulnerable communities to adapt." "Currently governments are considering multi-billion dollar investments in carbon capture and storage at power stations. Perhaps it is time to subject this to a full cost benefit analysis to see whether the technological option matches nature’s ability to capture and store carbon - a natural system that has been perfected over millions of years and with the multiple additional benefits for water supplies up to reversing the rate of biodiversity loss," he added. The TEEB team invites scientists and other experts to support its efforts with further evidence on the economic consequences of biodiversity loss. Via the TEEB website (www.teebweb.org), stakeholders can contribute to the different products currently under development via the TEEB Call for Evidence. For the forthcoming report on the ecological and economic foundations of TEEB, draft chapters will be online for comment on the website starting in September 2009. The final results of Phase II of the TEEB study will be presented in the autumn of 2010. In November this year a TEEB report for national and international policymakers will be released. This will be used to further engage stakeholders in dialogue on the issues and opportunities of responsible consideration of ecosystem services in policy development. Materials are available on the TEEB website www.teebweb.org. The TEEB study draws together expertise from the fields of science, economics and policy from around the world. Contributions feed into TEEB’s open architecture format and the philosophy of creating a public good. 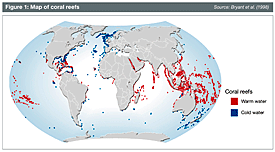 The Coral Reef data was drawn from a scientific statement on climate change and coral reefs published at a Royal Society Meeting organised by ZSL, the International Programme on the State of the Ocean (IPSO) and the Royal Society on 6 July 2009. Economic valuation of human welfare benefits derived from coral reefs was estimated at $172 billion annually (Martinez et al. 2007). Further background material on each of the points made in this release is available in the TEEB climate issues update. The Helmholtz Association helps solve major, pressing challenges facing society, science and the economy with top scientific achievements in six research areas: Energy, Earth and Environment, Health, Key Technologies, Structure of Matter, Transport and Space. With 28,000 employees in 16 research centres and an annual budget of around EUR 2.8 billion, the Helmholtz Association is Germany’s largest scientific organisation. Its work follows in the tradition of the great natural scientist Hermann von Helmholtz (1821-1894).